Manuscripts not written in the recommended format will be returned to authors. The Romanian Review of Geographical Education does not allow any form of plagiarism while being committed to high standards of research and publication ethics. The definition of “plagiarize” taken from the Merriam-Webster (2012) online dictionary and Plagiarism.org (2012), is “to present as new and original an idea or product derived from an existing source.” Sometimes that “existing source” is a work written by another scholar, and sometimes it is a work written by the author him-/herself. The latter circumstance constitutes self-plagiarism. Plagiarism most often takes the form of verbatim copying of passages from an existing source, but without the quotation marks and page numbers needed to convey proper attribution to the reader. However, pla-giarism can also take the form of “close copying,”wherein passages are taken almost verbatim from elsewhere but changed slightly (Wager, 2011) (COLQUITT, 2012, p. 749). 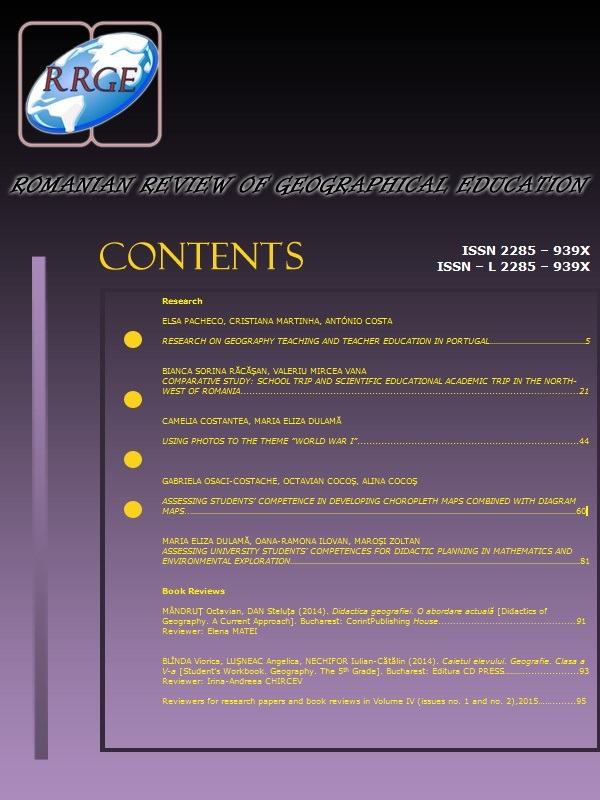 The articles from Romanian Review of Geographical Education are licensed under a Creative Commons Attribution 4.0 International License. This license lets others distribute, remix, tweak, and build upon your work, even commercially, as long as they credit you for the original creation. This is the most accommodating of licenses offered. Recommended for maximum dissemination and use of licensed materials. We do not charge any fees for authors (there are no processing, submission, or publication fees). COLQUITT, J. A. (2012) From The Editors - Plagiarism Policies and Screening at AMJ. Academy of Management Journal [Online] 55 (4), p. 749-751. Available from: http://aom.org/uploadedFiles/Publications/AMJ/plagiairism_fte_colquitt.pdf [Accessed: 10 December 2014].